Part two of enlightening your Attractive Character. 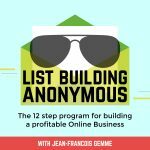 Today, Jean – Francois’s is joined by special guest and lead sales funnel builder at ClickFunnels, Stephen Larsen. He shares his expert knowledge on sharing your backstory and creating parables with power to build a great relationship with your audience. Everybody has a backstory. And your previous experiences are what determines who is attracted to you. Sharing your backstory is a powerful way to build know, like and trust relationships with your audience even before they’ve invested in what you have to offer.